This amazing recording by Vox Luminus (originally destined to be part of a review of new releases) is so extraordinary, it deserves a special showcase. 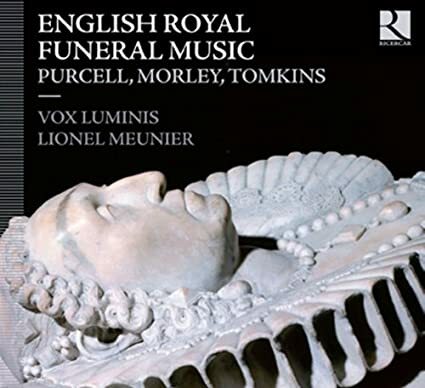 The extraordinary Belgian vocal ensemble Vox Luminis, winners of the prestigious 2012 Gramophone Recording of the Year, present a revelatory new recording of English Royal Funeral Music. The album, on Outhere's early music imprint Ricercar and available from Allegro Classicalon April 9, features music written for the funeral of Queen Mary by Purcell, Paisible, Tollett, Morley, Weelkes, and Tomkins. In awarding Vox Luminis the 2012 Gramophone Recording of the Year and Baroque Album of the Year for their previous recording of 17th-century funeral music-Musicalische Exequien by Heinrich Schütz-the magazine enthused: "The 12 voices of Belgian ensemble Vox Luminis put their faith in tonal focus and sweetly balanced textures ... their singing produces music-making of intimate, aching beauty. A marvelous disc." Shedding new light on the funeral of Queen Mary, Vox Luminis has created an elaborate reconstruction of the 1695 ceremony along with music heard at the funeral of Elizabeth I in 1603. The recording features three "Dirge Anthems" by Thomas Morley, originally written for the Elizabeth I; Henry Purcell's two pieces for slide trumpets ("The Queen's Funeral March" and "Canzona") and sublime a cappella anthems; and two marches by John Paisible and Thomas Tollet, which were played by a band of oboes during the funeral procession to Westminster Abbey. Also heard is the moving anthem by Thomas Weelkes on the death of Thomas Morley, "Death hath deprived me." The recording features contributions from two superb period instrument ensembles, Les Trompettes des Plaisirs and Lingua Franca. We know now that Purcell's three Funeral Sentences were not written for the funeral of Queen Mary in 1695. Following the tradition of the English court, it was pieces by Thomas Morley, originally written for the funeral of Elizabeth I, that were sung there. Purcell's only contribution to the ceremony was the composition of two pieces for slide trumpets (March and Canzona), and the anthem in the archaic style Thou knowest, Lord. During the funeral procession to Westminster Abbey, a band of oboes played two marches written by John Paisible and Thomas Tollet. This recording assembles the music composed for the funeral of Queen Mary and that used at the funeral of Elizabeth I in 1603. The programme is completed by Purcell's sublime a cappella anthems and a moving anthem by Weelkes on the death of Thomas Morley. Henry Purcell (1659-1695) was the last great English composer before the twentieth century. The program on this Ricercar CD performed by Lionel Meunier and Vox Luminis offers some of Purcell's most profound utterances, along with exquisite music by Thomas Morley (1557-1602) and Thomas Tomkins (1572-1656). The premise for this program of English funeral music fascinates without a note being heard. William III and Mary of England were crowned king and queen in 1689 and while William was absent, busy waging wars, Mary governed the country. Henry Purcell served the queen during this time, for a period of five years, until she succumbed to small pox in 1694, just short of her 34th birthday. Vox Luminis and Les Trompettes des Plaisirs, a quartet performing on the short-lived flatt trumpet (or slide-trumpet) and bass drum, perform the music that was played for Queen Mary's procession, her funeral at Westminster Abbey, and internment. One section of the service, The Funeral Sentences by Henry Purcell, is utterly heart-rending in the communion of sorrow and anguish, yet hope, that Purcell seems to express. There may be no more profound a communication in all the history of Western Music. Through colorful, sometimes stinging dissonance, the chromatic measured motion of the voices, and the subtle, fleeting appearances of a major mode, Purcell paints an image that only love and loss could inspire. You can listen to a section of this music in the audio sample provided, sublimely performed by Vox Luminis. The music of Purcell to be heard here is as profound and moving as anything from Bach, Mozart or Beethoven. If it is heard with a still mind and complete attention, one can scale the summit of possibilities that only great music can inspire.